There are some great resources on the GCM website if you have not seen it. 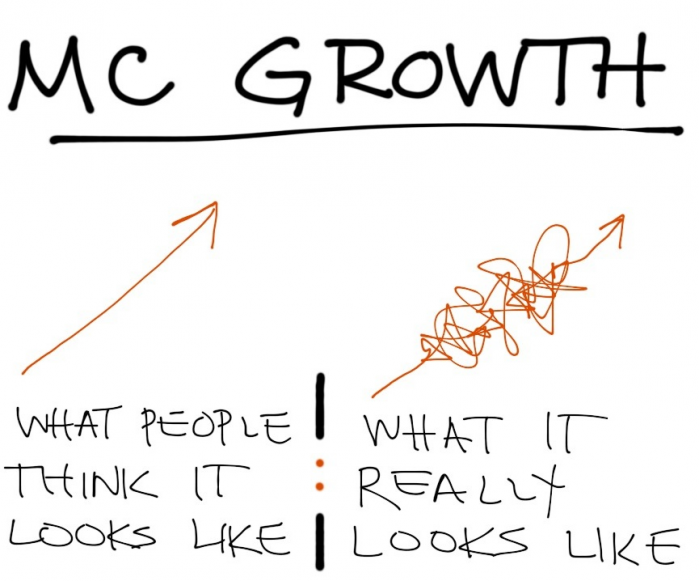 If I’m honest, I still tend to expect our MC growth to look like the drawing on the left, even as I experience it as the drawing on the right. I had this wonderful experience with a kid on my soccer team this week. He said, “Coach, what do you do for a job?” I answered, “I’m a pastor.” He gave me this funny look and said, “What’s that?” Keep in mind that this was in the middle of me trying to explain a drill to nine boys, most of whom were asking me questions at the same moment. I knew I didn’t have a chance to even begin to explain it to him right there, but it just confirmed to me that I was in the right place. It is exactly where I want to be and exactly the kind of conversations that I hope to build on in the future. I would love it if for the rest of his life, regardless of what happens, he thinks of a “pastor” as a person who cared about him on a rainy soccer field. My prayer is that he one day discovers that I was able to care for him because of the grace of Jesus in my life. This is a quote from an excellent article called “The Church’s Sleeping Giant” that talks about the roughly 60% of people who will not be reached by our traditional church models. It makes an argument for leveraging mega churches and multi-site churches to launch new missional communities. I would argue that mainline denominations could be leveraged in a similar way. Take a look, it is well worth reading. It has been awhile since I have posted any updates, but that doesn’t mean that our team has not been hard at work. OK… I did take a week to escape the rain and play in the Arizona sun! I wasn’t doing much work that week, but before and after the break our team has been wrestling with the question of “vision.” Who is God calling us to reach? Why do we need to reach them? We feel like we are close to answering these questions, but we still need to do the work of articulating them for everyone else. In the next couple of weeks I should be sharing our “vision statement” on this blog that will do just that. Vision is a tricky thing. We want to get it right, but we also know that it will develop and change over time as we respond to the Holy Spirit. Just think about how much things have changed in North American church life in the last century! I’ve been reading Reggie McNeal’s latest book, Missional Communities, that addresses how some churches are addressing some of these changes. I recommend it to you if you are looking for creative inspiration for your faith community. It is fun to think about innovative ways we can seek to be the “church” in our world today. The hard part is getting practical and putting the pieces together in a way that will work in a particular context. That is what we are trying to do. It is fun (for me at least), but it is not easy!